In October 2018, a landmark report commissioned as part of the 2015 Paris climate agreement found that “rapid and unprecedented” change is needed to limit global warming to a maximum of 1.5 degrees Celsius. In the clearest warning to date, the United Nations’ Intergovernmental Panel on Climate Change said if global temperatures rise above this point – even by a fraction of a degree – future droughts, floods and heat waves will be drastically worsened. Severe weather events are followed by equally extreme financial costs. As Morgan Despres, Head of the Secretariat of the Network for Greening the Financial System (NGFS), told World Finance: “Climate change will affect the global economy, and so the financial system that supports it.” A Stanford University study published in May said that failing to limit global warming would cost the global economy tens of trillions of dollars over the next century. For decades, the finance sector has dismissed climate change as a threat that was either not credible or too nebulous and distant to worry about. But as scientific research provides more quantifiable data on the cost of failing to act, banks, insurers and investors are beginning to take responsibility for the climate problem. The NGFS was created in 2017 to support the action undertaken by the 195 signatories of the Paris Agreement. It is formed of 18 central banks, including those of England, Germany, France and China, that have openly acknowledged that the financial risks of climate change are both system-wide and potentially irreversible if not addressed. As the heart of the global economy, financial institutions have an outsized responsibility to help limit these risks. “Solving climate change is a very capital-intensive undertaking,” said Trevor Houser, a partner at the independent research firm Rhodium Group. Trillions of dollars of investment is needed to fund low-carbon energy production, more efficient buildings and new agricultural practices. 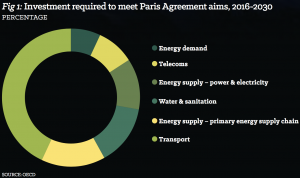 The OECD has estimated that, for each year from 2016 to 2030, an extra $600bn worth of investment in infrastructure will be needed to reach the aims of the Paris Agreement, with the transportation sector requiring the highest proportion of this financing (see Fig 1). “Financial markets will be a crucial source of that investment, and so financial institutions will play a key role in the redirection [of] capital from the types of investments that have contributed to the problem, to the types of investments that are going to solve it,” Houser told World Finance. While the benefit of these investments will only be realised in the long term, the scale of the problem calls for short-term action, according to Despres. The financial sector has long been criticised for its inclination towards short-termism. Corporate entities have become increasingly focused on producing short-term rewards for shareholders, which often come at the expense of longer-term objectives, a 2017 study by McKinsey revealed. However, companies that focus on long-term issues dramatically outperform their short-term thinking peers: according to McKinsey’s analysis, between 1999 and 2014, average returns and earnings growth were 47 percent and 36 percent higher respectively among firms that said they focused on long-term issues. In a recent survey, the Bank of England found out just how bad short-term thinking among bankers was: while 70 percent of respondents recognised that climate change posed financial risks, only 10 percent had taken a long-term strategic view of those threats. Following this, the Bank of England’s regulatory arm opened a consultation on requiring the boards of UK banks, insurers and building societies to put an executive in charge of climate-related risks. The bank’s Prudential Regulation Authority said the “far-reaching and foreseeable risks” of climate change should be addressed through firms’ existing risk management frameworks. In addition to assessing how climate change will impact their own operations, banks can accelerate change by funnelling money towards sectors and technologies that aim to reduce the impact of climate change. Arthur Lerner-Lam is a seismologist and the deputy director of the Earth Institute’s Lamont-Doherty Earth Observatory at Columbia University. He told World Finance that banks had begun evaluating climate-related risks more seriously through initiatives including environmental, social and corporate governance (ESG) investments and socially responsible investing. A number of banks in Europe, such as HSBC and BNP Paribas, have vowed to stop providing financing for high-carbon-intensity projects, such as coal power stations, oil and gas projects in the Arctic or the extraction of tar sands oil, which is said to be the dirtiest fossil fuel on the planet. Dutch bank ING has gone a step further, saying it will reassess its entire lending portfolio based on climate impact. However, the Banking on Climate Change report, published by the Rainforest Action Network, found that in 2017, 36 of the world’s biggest banks still poured $115bn into high-carbon-intensity projects, up 11 percent from 2016. 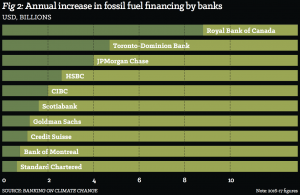 Despite its pronouncements, HSBC, along with a number of other household names, appeared in the report’s top 10 list for banks that increased their fossil fuel financing from 2016 to 2017 (see Fig 2). Major banks outside Europe have “done little to adopt policies that would bring their activities in line with the Paris Agreement”, the report concluded. But banks are increasingly realising that by continuing to siphon money into fossil fuels, they risk investing their money in so-called ‘stranded assets’. These are projects that unexpectedly lose value as a result of climate change. A 2018 study by Carbon Tracker found that up to $60bn of coal power assets in South-East Asia could cease earning an economic return in the next decade. This issue is rapidly appearing on investors’ agendas. In a 2017 investor survey by Ernst & Young (EY), more than 60 percent of respondents said the risk of stranded assets had caused them to either decrease their holdings over the past 12 months or monitor their holdings closely. Even with these moves, though, some say the pace of change in the banking industry is too slow. In February 2018, socially committed investment manager Boston Common Asset Manager said the banking sector was “failing to capture the risks and opportunities of climate change”. While some companies still treat climate change as an investor relations box-ticking exercise, a growing number are considering the potential risks of both physical and transition impacts – that is, variations in the physical effects of a changing climate and the impact of changes on climate-related policy. Insurance firms are undeniably exposed to the physical consequences of climate change. According to Moody’s Investors Services, their losses from extreme weather events have jumped in recent decades. In 2017, the insurance industry dealt with the fallout from three category four or higher hurricanes, wildfires in California, earthquakes in Mexico and a deadly monsoon season in South-East Asia. Extreme weather persisted in 2018, with the most destructive wildfires in California’s history, catastrophic flooding in the US and the strongest storm of the year in Typhoon Mangkhut. The insurance claims from devastating storms all around the world come back to European insurance and reinsurance companies, according to Geoffrey Heal, a professor of economics at Columbia Business School. For this reason, homeowners in Florida can no longer buy commercial hurricane insurance. After insurance providers hiked their premiums, the state’s government blocked them from raising their prices any higher and they all pulled out. “The state of Florida runs its own hurricane insurance, which probably would have been bankrupted by the recent events there, but we don’t know that for sure yet,” Heal said. In 2017, natural catastrophes cost the insurance industry a record $135bn in insured losses, about three times more than the 10-year average of $49bn, according to global reinsurer Munich Re. Including uninsured losses, the overall cost reached $330bn, the second-highest figure ever recorded for natural disasters. While it is difficult to trace individual weather events back to climate change, one study predicted how much man-made global warming worsened Hurricane Florence, which hit the southern US states in September 2018. Academic researchers estimated the hurricane would be about 80km larger and drop 50 percent more rainfall because of human interference in the climate system. About two thirds of globally active insurance and reinsurance companies have fully integrated climate change into their business model, according to the Geneva Association think tank. But the Asset Owners Disclosure Project found the industry still has a long way to go, particularly in the US: after examining 80 of the world’s largest insurers, with $15trn worth of assets under management, it found all but three US insurance firms had no plans in place to decarbonise their portfolios or address climate-related financial risks. While industries such as banking and insurance are certainly modernising their views on climate risk, other areas, such as asset management, are lagging behind. “There’s still too much noise around there being a need to sacrifice performance in order to support ESG issues,” Fisher said. He added that ESG rules should be providing investors with another data set to help them make a sensible investment decision, not a distinct way of investing. In the world of pension funds, nearly 90 percent of assets managed on behalf of global savers are exposed to potential losses in the long term, according to a study by the Asset Owners Disclosure Project. Just 13 percent of the assets managed by the world’s largest public pension funds have undergone a formal assessment for exposure to climate-related risks. But investors are increasingly voicing concerns about the nonfinancial performance of their portfolios. EY’s investor survey found that the proportion of investors that dismiss nonfinancial and ESG information as immaterial or trivial had fallen. Of the respondents, 68 percent said nonfinancial information had played a pivotal role frequently or occasionally in their investment decisions in the previous year, up by 10 percentage points from 2013. As more investors seek to address global warming with their funds, Lerner-Lam warned that a climate innovation gap has opened up between research and development labs and the venture capital investors needed to get these projects off the ground. Communication between innovation labs and investment communities is necessary for the development of sustainable technologies, Lerner-Lam said. Columbia University is working to close this gap by holding a clean technology showcase to open up discussions about commercial opportunities with investors. Government policies could also encourage the investment community to get behind critical technologies. The political atmosphere around climate change shifted significantly after the Paris Agreement. Along with generating publicity for the issue, COP21 helped governments focus their attention towards specific targets. These goals have influenced the way financial firms perceive the risks and opportunities of climate change. The sheer scale and the number of moving parts involved in the climate change problem remain daunting. While Fisher admitted he is often disappointed by the lack of knowledge and progress he sees in the financial industry, he said there are many days when he feels optimistic about the change occurring in the sector – from the increased pressure from prudential regulators to the widening interest in climate issues. There is no existing taxonomy that has been universally agreed for what is green and what isn’t, Fisher said. One possible global framework for environmental disclosures was presented by the Task Force on Climate-related Financial Disclosures (TCFD) in 2017. The group, which was set up by the Financial Stability Board in 2015, issued recommendations on what companies should disclose to enable financial markets to understand climate-related financial issues. Under these voluntary recommendations, companies are called to disclose their governance around climate-related risks and opportunities, impacts on the company’s business and strategy, and the metrics used to assess climate-related risks. 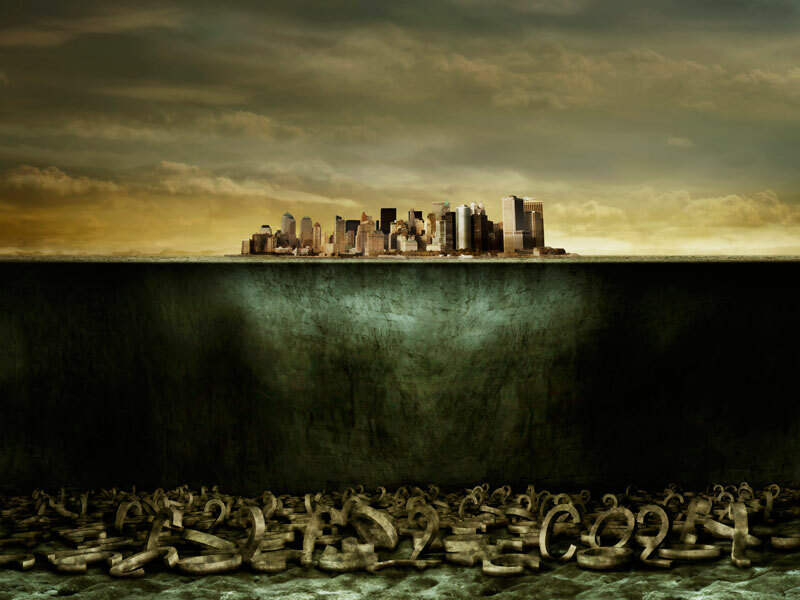 “The purpose is to fill the data gap. We need financial stakeholders to produce comparable, granular data, with good quality,” Despres said. Some work is being done on this in France, where institutional investors are required to disclose their climate risk and alignment with a national low-carbon strategy. The European Union is now moving towards implementing similar rules. “The ultimate purpose is to create fully fledged green markets relying on the same perception of greenness, which necessitates spreading best practices in order to infuse the whole financial system,” Despres said. The private sector is waking up to the fact that good management requires addressing the climate change problem. Furthermore, as the international response to climate change gathers pace and focus, financial industries are seeing that this is a market full of opportunities. “The capitalist system can be used productively,” Lerner-Lam said. “Let’s admit that we’re looking at an environmental situation which is with us now, as demonstrated by some of the [recent] extreme events.” The financial sector is recognising this and looking to it for opportunities for investment and to make returns, he added.